World-reflecting Mosque, commonly known as the Jama Masjid of Delhi, is one of the largest mosques in India. It was built by Mughal emperor Shah Jahan between 1644 and 1656 at a cost of 1 million rupees, and was inaugurated by an imam from Bukhara, present-day Uzbekistan. The mosque was completed in 1656 AD with three great gates, four towers and two 40 m high minarets constructed of strips of red sandstone and white marble. The courtyard can accommodate more than 25,000 persons. There are three domes on the terrace which are surrounded by the two minarets. On the floor, a total of 899 black borders are marked for worshippers. The architectural plan of Badshahi Masjid, built by Shah Jahan's son Aurangzeb at Lahore, Pakistan, is similar to the Jama Masjid. 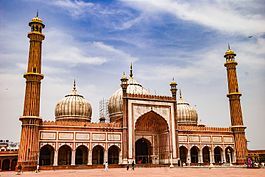 This article uses material from the Wikipedia article "Jama Masjid in Delhi", which is released under the Creative Commons Attribution-Share-Alike 3.0 License.